After experiencing a successful observing run the other night with iTelescope.net, I was looking forward trying out another one of their robotic telescopes (Takahashi Epsilon 250mm f/3.4 on a Paramount PME using an SBIG ST-10XME CCD camera) in Mayhill, New Mexico. Needing a good night of rest, I made my first attempt at automating a script using the "Plan Generator" available on the iTelescope.net website. I set a plan for imaging the spiral galaxy NGC 2903 in Leo, creating four images at 300 seconds per image with Red, Green, Blue and Clear filters. Unfortunately, there was a slight tracking error during the blue image exposure that made stacking the images for creating a color picture of the galaxy impossible. I figured I would also experiment with different binning values. I found that the best value is "1", that I applied on the "Clear" exposure. There is much less noise on the exposure than using the value of "2, which I did on the RGB images. 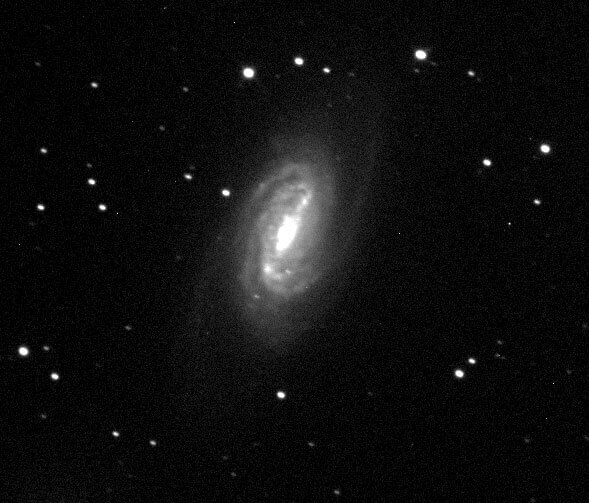 It is rewarding to create colorful astronomical images from the data acquired by these remote instruments, however, creating just one good clear grayscale image of a galaxy is more than enough to examine for Extragalactic Supernovae suspects like the image on this post that I acquired last night. I am now feeling more than comfortable utilizing the equipment that iTelescope.net has to offer for pursuing student research projects until our own 16" Dreamscope is online.